This post is a bit longer than usual. But if you are interested in the invisible dimension of leading profound social change -- and in a blend of action science and consciousness to illuminate that blind spot -- it may be worth the read. My father is a farmer. As one of the pioneers of bio-dynamic farming in Germany, he devotes all his attention to cultivating the quality of the soil in his fields. That's exactly what I find myself doing today, though in a very different type of field. My colleagues and I, along with countless change makers, leaders, action researchers and facilitators, are cultivating the quality of the social field. By social field I mean the structure of the relationship among individuals, groups, organizations and systems that gives rise to collective behaviors and outcomes. When people experience a transformational social shift, they notice a profound change in the atmosphere, in the texture of the social field. But in trying to explain it, they tend to fall back on vague language; and even though people can agree on a surface description of what happened, they don't usually know why it happened or what words to use to describe it. The intention of this paper is to uncover the grammar of the social field -- the key variables that make it possible for the operating logics and modes (states and stages) of a social field to shift. All human beings participate in co-creating the complex social networks that we live in and engage with. Still, despite the fact that seven billion people are busy co-creating this field moment to moment, the process of social reality creation remains enigmatic because it is connected to our blind spot. Most people much of the time experience social reality as something exterior -- as a world "out there" that is doing something to us. That is, most of us are unaware of the process that brings our social reality into being in the first place: the source from which our attention, intention, and action originate when we engage with others and with ourselves. In this essay, I build on the work of one of the twentieth century's most innovative social scientists, Kurt Lewin. Lewin viewed the social environment as a dynamic field that interacts with human consciousness. Changes in the social environment affect particular types of psychological experience, and vice versa. In his field theory, a field is defined as "the totality of coexisting facts, which are conceived of as mutually interdependent." He believed that, in order to understand people's behavior, one had to look at the whole psychological field, or "lifespace," within which people act. Lifespaces are constructed under the influence of various force vectors. Accordingly, human behavior is determined by the totality of an individual's context. This context is a function of the field that exists at the time the behavior occurs. Lewin also looked to the power of underlying forces (needs) to determine behavior by integrating insights from topology (e.g., lifespace), psychology (needs, aspirations, etc. ), and sociology (e.g., force fields). Lewin's field theory was groundbreaking in twentieth-century social psychology and action research and led to the development of numerous experiments and projects. Awareness and sensitivity training in T-groups in the 1950s and '60s, and the dialogue practices, and organizational learning methods at the end of the century, are all part of this lineage. As I write about social fields from a twenty-first-century perspective, I am able to draw on major insights and sources of knowing that were not available to Lewin when he did his pioneering work -- specifically, the most recent research on brain plasticity and neurophenomenology, as co-developed in the work of the cognitive scientist Francisco Varela. 1. Wholeness. Social fields are whole. Because all human beings are connected, what happens to other people also happens to an individual. This is not only because everyone shares the same ecosystem and is connected through multiple interdependencies, but, most important, because all people are directly connected to one another, as becomes manifest when we enter the deeper states of the social field. 3. Interiority. What differentiates social fields from social systems is their degree of interiority. Social systems are social fields seen from the outside (the third-person view). At the moment we cross the boundary between them and step inside a social system -- that is, at the moment we begin to inquire into its interiority by turning the camera around (from the third-person to the first-person view) -- we switch the perspective from the social system to the social field. Once we cross this threshold we discover the interiority (or being-ness) of this field -- its inner landscape. It shows up in the form of different states that transform our first-person experience along the seven dimensions outlined below (points 4-10). When it happened, I could feel my play rise to a new level. It came rarely, and would last anywhere from five minutes to a whole quarter, or more... It would surround not only me and the other Celtics, but also the players on the other team, and even the referees. At that special level, all sorts of odd things happened: The game would be in the white heat of competition, and yet somehow I wouldn't feel competitive, which is a miracle in itself... The game would move so quickly that every fake, cut, and pass would be surprising, and yet nothing could surprise me. It was almost as if we were playing in slow motion. During those spells, I could almost sense how the next play would develop and where the next shot would be taken... My premonitions would be consistently correct, and I always felt then that I not only knew all the Celtics by heart, but also all the opposing players, and that they all knew me. During those spells, I could almost sense how the next play would develop and where the next shot would be taken... My premonitions would be consistently correct. 5. Space widens. The experience of space opens up. In moments of profound shifts in group processes, participants often sense a widening of the surrounding collective space, particularly upward. 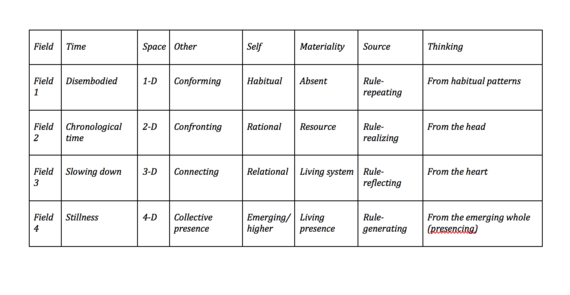 When moving from Field 1 to Field 4, the texture of the social space morphs from one-dimensional mental images (Field 1), to a two-dimensional exterior connection between observer and observed (Field 2), to a three-dimensional social space where the observer moves inside what is being observed (Field 3), to a four-dimensional living time-space in which awareness becomes more panoramic and perception takes place from the evolutionary movement of a social field, where one senses the space of future possibility (Field 4). 7. The self is "de-centering." The experience of self shifts from a localized center-self (Field 1), to a rational self that is anchored and operates from inside the head (Field 2), to a relational self that operates from the heart (Field 3), to an emerging higher self that is connected to and operates from a surrounding sphere of possibility (Field 4). This awareness is sometimes also referred to as panoramic awareness. Russell seems to refer to a panoramic awareness of the entire field, "including all the opposing players." 8. Materiality changes form and quality. The quality of matter and sensual perception also shifts. For example, in moments when social presencing happens, workshop participants often report a "thickening" and "warming" of light. In moving from Field 1 to Field 4, one's sense of the planet evolves: from a perception of absence (Field 1), to an awareness of its function as a resource (Field 2), to an awareness of its function as a living system (Field 3), to an appreciation of it as a living being or presence that holds the space for connecting to our deepest levels of humanity (Field 4). 9. Connecting to Source: rule-generating. Connecting to source, or "presencing," means being present and acting from a direct connection to our deepest source of creativity and self. Connecting to the source often comes with an experience of a presence that isn't me-centered but operates through me. Sometimes that presence emerges from a relationship with another person. Sometimes that presence is simply felt, a collective awareness that "sees" us from the surrounding sphere. The members of the Circle of Seven referred to this awareness as "the presence of the Circle Being." 10. From habitual thinking to presencing. The quality of thought -- thinking -- creates the world. As we move from Field 1 to Field 4, our quality (and center) of thought moves from habitual, or the absence of true thinking (Field 1), to thinking from the head by relating to the world as a set of exterior objects (Field 2), to thinking as an activity from the heart that allows us to relate to the world from both outside and inside (Field 3), to thinking as an activity at the source of the social field, that is, from an awareness of emerging future possibilities (Field 4). These four modes of thinking embody four different gateways for connecting to the world: habitual thought (downloading), rational thought (seeing), empathic thought (sensing), and generative thought (presencing). 11. Co-creativity. A social field, once its deeper interiority is activated, turns into a generative field that allows its participants to access their deepest sources of creativity, both individually and collectively. The co-creative flow that occurs in generative social fields can be, in the words of cognitive psychologist Eleanor Rosch, "shockingly effective." As the stream of emergence deepens, the relationships between the parts and the whole, between individuals and the social whole, shifts in subtle ways. In Field 1, the self is at the center, inside of its own boundaries, locked into its current identity. As the system moves through Fields 2-4, the self functions with progressively more open boundaries and eventually from its surrounding sphere. 12. Non-locality. Generative social fields regenerate and to some degree replicate or multiply themselves over time - -often over many, many years; they also transcend the boundary of space by becoming non-local. Being non-local means that, once I have a deep heart-to-heart connection with the other, I can feel the impact of this relationship and its real-time changes regardless of our spatial proximity. 13. Matrix of Evolution. Activating the deeper levels of the social field is like reintegrating matter and mind on the level of the collective. If the collective body and mind are separate, social systems will download the patterns of the past (rule-repeating). When the collective body and mind are integrated, we see the rise of generative social expressions that operate from a direct connection to source (rule-generating). The Matrix of Social Evolution spells out the idea of moving from body-mind separation to integration. On the horizontal axis we see four system levels of action (individual, group, organizational, and systemic); on the vertical axis we see four degrees of separation between matter and mind. In row 1 we see how the social field manifests when there is full separation between collective body and mind -- that is, between action and awareness (Field 1: downloading). By contrast, row 4 depicts how the generative social field manifests when there is full integration between the collective body and mind, that is, collective action and awareness (Field 4: presencing). 14. Consciousness. Consciousness is the independent variable that can facilitate a change in the degree of separation between body and mind (or action and awareness) on the level of the collective. 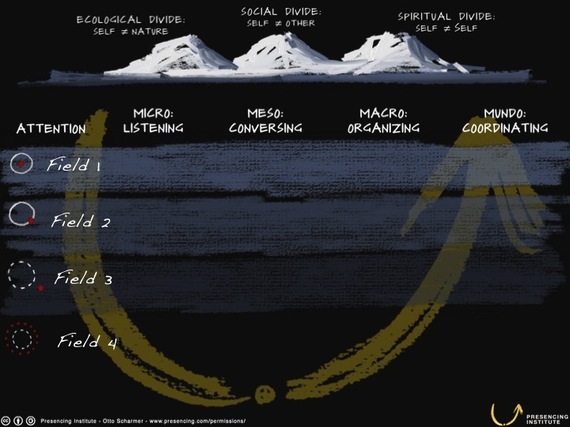 The Matrix of Social Evolution spells out the evolution of social fields through four levels of consciousness: traditional (level 1), ego-system awareness (level 2), stakeholder awareness (level 3), and eco-system awareness (level 4). The development of social fields is the embodiment of a human consciousness that is evolving from ego to eco. Viewed from this angle we see the current global ecological and social crisis as a call to shift our way of operating from ego-system to eco-system awareness. 15. Mirroring. To change the operating levels of a social field, people need a mechanism that helps them bend the beam of observation back onto the observing self. When this happens for the individual (micro), we call it mindfulness. Mindfulness is the capacity to pay attention to your attention. When this happens in a group, we call it dialogue. Dialogue is not people talking to each other. Dialogue is the capacity of a system to see itself. What's missing in today's capitalism is a set of enabling or mirroring infrastructures that would help our systems to sense and see themselves and thereby remove the barriers preventing the next round of profound institutional innovation and systems change. 16. Holding Spaces for Courage, Love, Listening. In early 2015, we asked the 10,000 plus participants in a global U.Lab (an MIT-sponsored MOOC), what it would take to realize their "highest future possibility." What would it take to bring it into reality "as it desires" (Martin Buber)? Their resounding answer was simple and clear: courage! Then we asked them what support they would need from others in order to actually make it happen, to make it work. Again their answers very clear: love, listening and trust! These responses from a multi-cultural community of change makers are similar to the responses we've heard from others. Profound shifts in small groups tend to happen when the two following conditions are in place: (1) individual courage and vulnerability, and (2) a holding space of deep listening with unconditional love. That view reflects a naïveté in the current mindfulness movement; it tends to be ignorant about the collective structural dynamics of profound social change. From the perspective of social fields the essential question is: How can we apply the power of mindfulness not only to the cultivation of the individual but also to the transformation of the collective--that is, the evolutionary shift of social fields? 18. Collective cultivation practices: social field mirroring. To activate the fourth level of the Matrix of Evolution (generative fields) not only requires institutional innovations around the eight acupuncture points but also new learning infrastructures that today exist in part on the micro and meso levels (individual and teams) but that are largely missing on the macro and mundo levels (organizations and systems). Figuring out how to co-create these new learning infrastructures is one of the most interesting challenges of our time. At the MITx U.Lab and the Presencing Institute we have developed and tested several building blocks for such collective cultivation practices, including deep listening case clinics, technology-enabled global stillness practices, and Social Presencing Theater. All three of these practices effectively do the same thing: they activate the fourth level of the social field and then turn that field into a mirror that allows the actors to sense and see themselves from the evolving whole. 19. Two core axes of the social field: collective body-mind and self-other. 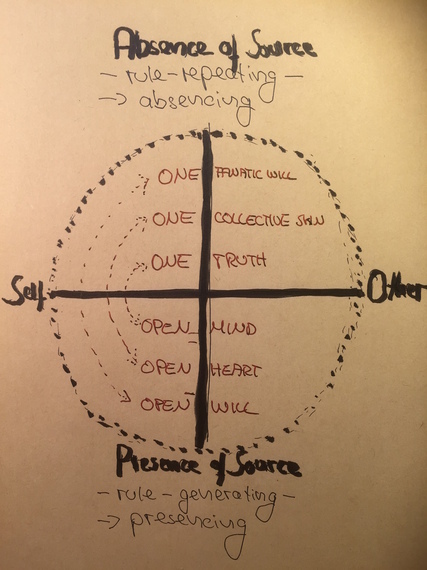 The vertical axis depicts the body-mind split of the collective--that is, the degree of disconnect between collective action and awareness (presence or absence of Source). The other axis depicts the split between self and other--that is, the degree of disconnect between actors in a social system. Currently, the social field suffers from the combined effect of both splits. Case in point: global climate change. We collectively produce results that no one wants: severe climate destabilization. That's the body-mind split. Why, then, don't we wake up? Because at this point the second split kicks in: I am so remote from the people who are beginning to feel the worst impact of climate destabilization that in spite of their suffering, nothing motivates me to move from beginning awareness to action. How does the vertical split, the split between the collective body (collective actions) and mind (awareness) show up in real life? The reintegration shows up in the opening of the mind, of the heart, and of the will (cycle of presencing). The disintegration shows up in their opposites: getting stuck in ONE Truth, ONE collective skin (us vs. them) and ONE fanatical will -- a.k.a. fundamentalism or cycle of absencing. Stepping back, what is the essence of the social field? What does the double split mean for our challenges on every scale (individual, team, organization, system)? In essence it means that (a) the only way to connect to my deeper sources of creativity and self is by opening my heart to others around me, and (b) the only way to really address the ever-growing challenges that accumulate around us is by looking into the mirror of the social field. The moment these two things happen simultaneously--opening the heart and looking into the mirror of the generative social field--magic happens, and the co-creative flow of social fields begins to be "shockingly effective." The above reflection points are placeholders for that bigger transformation to come: shifting the social field on the scale of the whole. At the core of this movement, however, is not an abstract strategy, but the emergence of a new, living relationship between the individual and the whole. That relationship allows the individual to open up to the well-being of the whole and to see herself (himself) through the mirror of that social field; while the emerging whole comes into being only to the degree that it can presence itself through individual initiatives and collective actions that arise from the community--from the field. The recent results of the global MITx U.Lab prototype in early 2015 and countless other initiatives that are beginning to activate the fourth level of the social field represent an important source of hope at a time of significant disruption. Its a time when courage, love, and listening are in more demand than ever before. May these initiatives mark the beginning of a new platform that integrates science, consciousness, and institutional renewal by putting learners into the driver's seat of profound social change.